Low Parks Museum provides a unique and historical setting for wedding, corporate and social events. 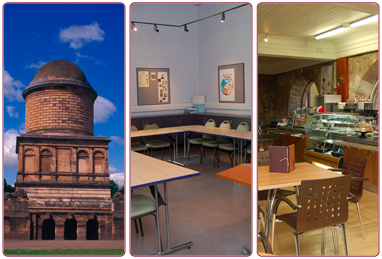 Set in the oldest surviving building in Hamilton, and recently fully refurbished, the museum complex is now a major cultural attraction and venue in South Lanarkshire. It has been awarded 5 stars, the highest visitor attraction accolade available under the national Visit Scotland grading scheme. Our on-site catering team will be pleased to assist in arranging food and drink to suit your requirements - everything from toast drinks to a celebration lunch, buffet or dinner. This table contains information on the capacity of the rooms and halls at Low Parks Museum, Hamilton.